From Columbus to Woodrow Wilson, this lighthearted poetry collection introduces dozens of personalities and groups of people who contributed, for better or for worse, to the history of the United States. Accompanied by caricatured illustrations of each figure, the poems give little glimpses into the lives, quirks, mistakes, and triumphs of presidents, pioneers, scientists and statesmen. 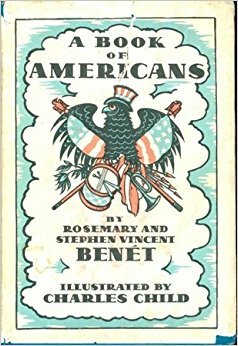 A Book of Americans was published in 1933, but there is very little about it that makes it feel outdated. Each poem is surprisingly contemporary-sounding, with lots of jokes about the foibles of these historical figures and subtle admonishments about the treatment of Native Americans and slaves. Even the poems which represent a larger group, such as Indians or French Pioneers, or Puritans, give a personality to these segments of the population and have some clever or poignant insight about their role in the development of our country. What I liked most, though, is the very even-handed way the authors seem to view American History. There is no shying away from negativity - James Buchanan is all but torn apart, for example - but neither is there any romanticized urging for the next generation to correct all the wrongs that have gone before them. The authors seem to accept historical happenings matter-of-factly, and their poems simply convey the facts of these events in an engaging style and format. The final poem of the collection, "U.S.A." also indicates the poets' reasonable understanding of their own place in history. "All our novelties and platitudes," the end of the first stanza proclaims, "Will be Rather Ancient History in 2033." -And we shan't know all the answers till we're history, ourselves. Thinking about our current political climate, in which so many are concerned with being on "the right side of history" this struck me as a particularly clear-headed and rational way of considering our own place in the timeline of significant events. I like that the book doesn't emphasize the here and now as superior in any way to days gone by. It's all a part of the history of the same country, and it's all worth knowing, even if we don't fully understand our role until we're gone. I prefer this outlook to the alarmist "we must stop reading about old white men!" messages much of the children's literature community seems to have adopted. When we study American history in our homeschool, I look forward to supplementing our lessons with some of these poems. They are a great way to introduce the different characters who will appear in our history books, and they would make good memorization exercises too. This book also covers some people who might not get much attention in history books at all, such as the first real Americans ("They were only babies. / They didn't care. / Peregrine White / And Virginia Dare.") and Nancy Hanks (whose ghost might ask "Where's my son? / What's happened to Abe? / What's he done?") While not an essential resource by any means, I think A Book of Americans will be a welcome addition to our curriculum and a fun way to bring history to life.